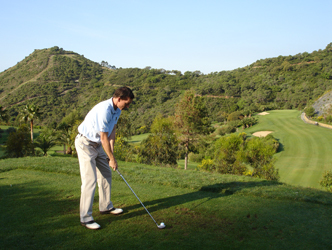 Los Arqueros Golf is a mixed course situated less than an hour from the international airports of Málaga and Gibraltar, and only 10 minutes from Marbella. It was the first golf course to be designed by Severiano Ballesteros. As the designer himself says, Los Arqueros is a good course for players of all kinds - a reasonable challenge for the average golfer and a tough test for professionals. It is set among the mountains of the Sierra de Ronda, and has an original layout in beautiful surroundings. Its prime location on the Costa del Sol makes this an ideal destination for a stress-free golfing holiday. Hotell i närheten: H10 Andalucia Plaza Hotel ligger gå avstånd från Puerto Banus, mycket populärt bland våra golfare för deras pris och kvalite. Andra hotell Pyr Banus, Benabola och många flera.